Fahrenheit version of our most popular configuration. Select irreversible temperature points to allow for detection and recording of most overheat occurrences. .75" x 1.75" (19 x 44 mm). Celsius version of our .75" x 1.75". Our most popular irreversible label for general purpose maintenance. Mini Four - Position Irreversible Temp-Plates in Fahrenheit temperatures. .38" x .82" (10 x 21mm) size fits tight spaces. Mini Four - Position Irreversible Temp-Plates in Celsius temperatures. Monitor overheat occurrences in tight spaces .38" x .82" (10 x 21 mm). Round Mini Four - Position Temp-Plates are irreversible. This model features Fahrenheit temperatures. .56" Diameter (14 mm). Detect and record overheat occurrences in degrees Celsius. .56" (14 mm) diameter. Our smallest model, useful for detecting overheat on circuit boards, semi-conductors, and many other miniature conditions. Fahrenheit model. .13" x .44" (3 x 11 mm). Measure overheat in the tightest of spaces with our smallest Temp-Plate model. Useful for circuit boards, semi-conductors and many others. °C model .13" x .44" (3 x 11 mm). Round Label Configuration for small spaces. Irreversible monitoring of overheat. Fahrenheit version. .25" (6 mm) diameter . Micro sized round label configuration for small spaces, Celsius version monitors and records overheat occurrences. .25" (6 mm) diameter. Select any four recording temperature positions. Minimum 90°F (32°C) maximum 350°F (176°C). Note that no temperatures are printed on the non-reversible temperature labels. A legend supplied with each box provides identification of the selected points. .25" Diameter (6 mm). Four Position not enough? Our MINI Six-Position label is an off-the-shelf solution. .38" x 1.16" (10 x 29 mm). When Wahl's selection of Four-Position temperature strips provide too few recording positions, we can still offer an off-the-shelf solution. .38" x 1.5" (10 x 38 mm). 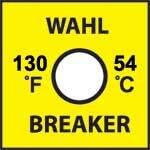 When the recorded temperature reached is a question of one point only, or space is at a minimum, Wahl Single-Position temperature stickers provide history at a glance. .56" Diameter (14 mm). Only one critical temperature? Monitor One °C or °F temperature point only to provide overheat history at a glance. Perfect for warranties and critical process points. 1" x .75" (25 x 19mm). Special Application Micro Four-Position Temp-Plate Base Part No. 450 Specialized Micro Four-Position IC Batch and Vacuum Chamber Labels for monitoring overheat conditions directly on the surface of integrated circuits during wafer fabrication. Designed to withstand exposure to high heat, vacuums and corrosive gases when used in the demanding semiconductor industry. .2" x .65" (5 x 16.5 mm). Specialized MINI Four-Position IC Batch and Vacuum Chamber Labels for monitoring overheat conditions directly on the surface of integrated circuits during wafer fabrication. Designed to withstand exposure to high heat, vacuums and corrosive gases when used in the demanding semiconductor industry. .38" x .82" (10 x 21 mm). Round Label configuration of our specialized IC Batch & Vacuum Chamber labels. Withstands high heat, vacuums & corrosive gases. .56" (14 mm) diameter. Custom Temp-Plates produced to customer’s specifications. Custom size, shape, range, positions, color, and logo imprint, subject to factory approval. Temp-Plate Certifications Certificate of Conformance, Order Certification, or NIST Certification with Data. Economical non-reversible chemical change thermometers.